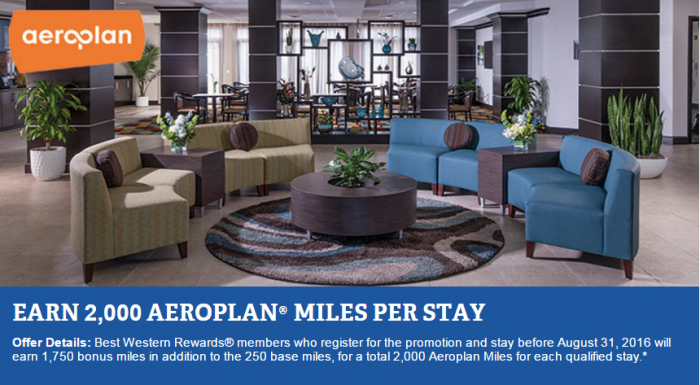 Best Western Rewards has extended the bonus miles promotion for Air Canada Aeroplan member stays that was supposed to en in April until the end of August. You can earn 1,750 bonus miles in addition to the usual 250 base miles between January 20 – August 31, 2016, for total 2,000 miles per stay. Best Western Rewards® and Aeroplan® Promotion Terms and Conditions Individuals who (a) have enrolled in the Best Western Rewards program; (b) have chosen Aeroplan as their earning preference; and (c) have registered for the Promotion between January 20, 2016, and August 31, 2016 (“Promotion Period”), will earn 1,750 Bonus Aeroplan Miles for each qualified stay* at any Best Western® branded hotel in Canada, the United States, or the Caribbean Islands during the Promotion Period. (The 1,750 bonus miles is in addition to the 250 base miles, for a total of 2,000 Aeroplan Miles for each qualified stay.) BEST WESTERN REWARDS ENROLLMENT, PROMOTION REGISTRATION, AND SELECTION OF AEROPLAN AS EARNING PREFERENCE REQUIRED PRIOR TO THE FIRST QUALIFIED STAY. Enrollment into the program and registration for the Promotion can be completed at www.bestwestern.com/appromo10. *A “qualified stay” for the purpose of this Promotion is defined as one or more consecutive nights at the same Best Western branded hotel at a rate eligible for earning Aeroplan Miles through Best Western Rewards. Only one check-in/check-out permitted per qualified stay. Qualified stays, which take place during the Promotion Period, but which have a check-out date that overlaps the ending of the Promotion Period, will be counted towards the Promotion. Promotion may not be valid with other offers, promotions, or discounts. Promotion is subject to cancellation or change without notice. Please allow 4 – 6 weeks for Bonus Aeroplan Miles to post after completed stay. All Best Western Rewards program rules apply. Visit www.bestwesternrewards.com for complete Program terms and conditions. Each Best Western® branded hotel is independently owned and operated. Best Western and the Best Western marks are service marks or registered service marks of Best Western International, Inc. ©2016 Best Western International, Inc. All rights reserved. ®Aeroplan is a registered trademark of Aimia Canada Inc.